HAMILTON which is the largest town in Caldwell County was founded in 1859 along the route of the Hannibal and St. Joseph Railroad. It was founded by Albert Gallatin Davis and named for Alexander Hamilton and Joseph Hamilton. Signs of the Victorian town are visible yet today. Hamilton's business community offers a variety of retail and service businesses, as well as antique shops and malls. Many services and activities make this small town attractive to its residents and visitors. They include a AAA rated school system, the Hamilton Public Library, Hamilton Community Arts Theater, a new swimming pool, 9-hole golf course, several churches, medical clinics and two major festivals held each year. 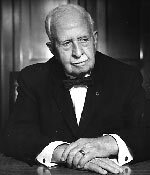 Hamilton has the distinction of being the birthplace and boyhood home of James Cash Penney (J.C. Penney) who was born September 16, 1875. He established a chain of department stores across the nation and used the old fashioned values he learned in Hamilton as a foundation for his business and personal life. He always maintained a close relationship with his hometown. Penney donated funds to help build the first library, the shoe factory, the high school, Highland Cemetery and the American Legion Park. Today Hamilton has a beautiful museum that houses a public library and a well-used community room, as well as his boyhood home.